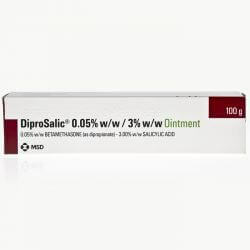 Diprosalic Ointment 100g is a smooth, off-white ointment which contains the active ingredients betamethasone dipropionate 0.064 % w/w (equivalent to 0.05 % w/w betamethasone) and salicylic acid 3.0 % w/w. It is used to treat skin conditions where the outer surface of the skin is covered by a layer of scales. 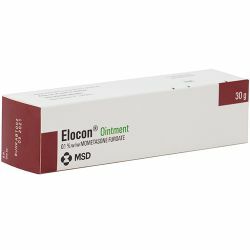 Diprosalic Ointment 100g will remove the layer of scales and reduce the redness and itchiness caused by the skin problem. Diprosalic Ointment 100g should be kept out of reach and sight of children. It should not be stored above 25 degrees celcius. When using Diprosalic Ointment 100g be sure to follow the doctors instructions and read the patient infromation leaflet before using. Wash your hands before and after each use. Rub a thin layer into the affected area twice a day. Do not use the ointment on your face for more than 5 days.Do not use a large amount of ointment on large areas of the body for a long time (for example every day for many weeks or months). Avoid getting the ointment in your eyes if this occurs rinse eyes immediately with clean cold water. 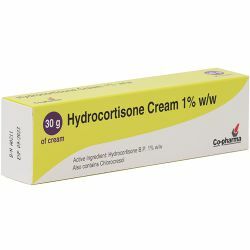 The active ingredients in Diprosalic Ointment 100g are betamethasone dipropionate 0.064 % w/w (equivalent to 0.05 % w/w betamethasone) and salicylic acid 3.0 % w/w. The other ingredients are liquid paraffin and white soft paraffin. 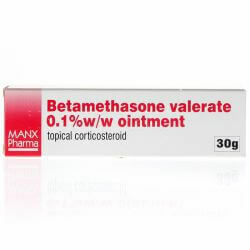 Do not use if you are Diprosalic Ointment 100g allergic to any of its ingredients or for any skin condition other then the one(s) it has been prescribed for. As with all medicines Diprosalic Ointment 100g can cause side effects, althougth not everybody gets them. All known side effects will be listed in thepatient information leaflet provided with the product. If you experience any of the side effects in the patient information leaflet or ones which are not listed in the patient information leaflet contact your doctor or pharmacist.